Sometimes you read a story that you KNOW from the start will stay with you forever. A story that just sticks. A story that swiftly works its way into your heart. A story that means the world while becoming your world. Entrancing and emotionally-charged, The Impossible Vastness of Us is an inspirational story of young love that imprints on the heart and soul. I delved into rare territory, a young adult romance, and oh was The Impossible Vastness of Us an incredibly MOVING and MESMERIZING journey. The fierce and fiery angst of this teen romance made my pulse pound and my heart beat out of my chest. The characters are full of fire with a story so heady, harrowing, and heartfelt. India is the youngest and strongest heroine I’ve encountered in a long time. A warrior, India is young but has already lived a life of hell. This beautiful girl bravely hides a shattered soul. I admired India a lot!!! I was probably insane to even think about him — this beautiful, rich boy — but he was getting to me. Nobody got to me. Finn is gorgeous, tall, athletic, and insanely rich. He, like India, is broken but wields a sword of bravery in spades. I LOVED this hero so much!!! Broken sees broken, and Finn and India are two shattered souls trying to be whole. I saw him. I think he was the first person I’d ever truly seen and I couldn’t help it — I wanted him to see me, too. Passion penetrated me, these words so poignant. I cried so many tears of sadness and sweetness. I felt each word slice through me, my emotions enveloping me where I was ALL IN this story. Finn and India’s connection is MAGICAL!!! I loved this heart-wrenching and heartwarming romance that made ME FEEL ALIVE!!! 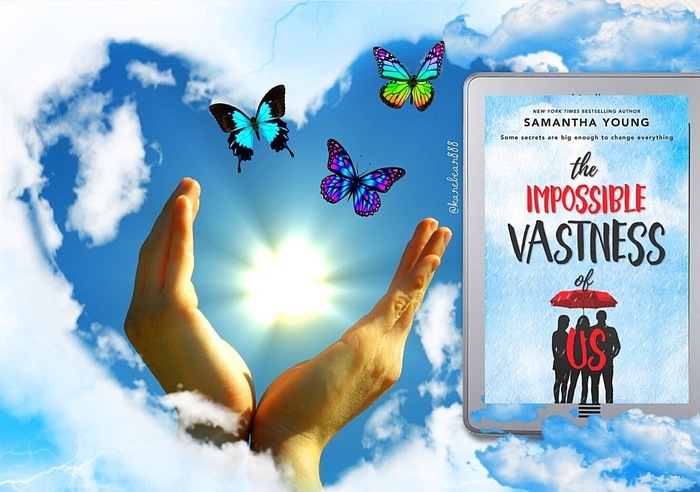 The Impossible Vastness of Us by Samantha Young was not what I expected; it was a million times MORE!!! 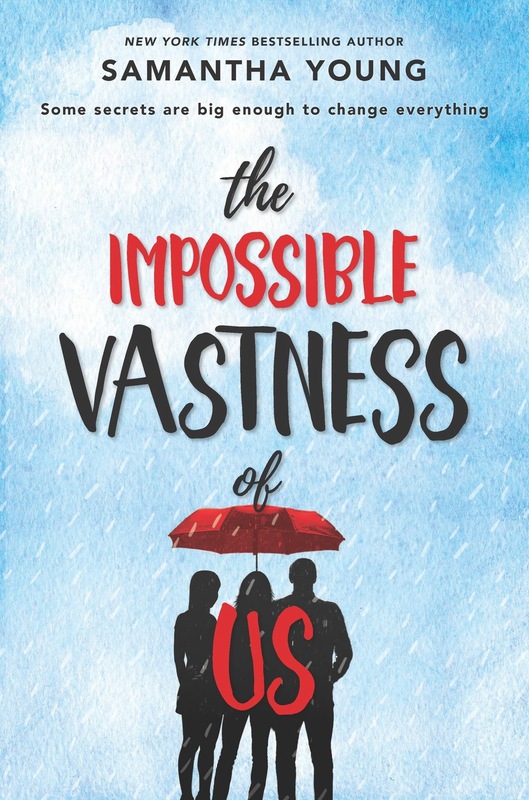 The Impossible Vastness of Us is an EPIC young love story and beyond!!! This book is strength in spades. This book is healing after heartbreak. This book is accepting and embracing differences and diversity. This book is hard-fought freedom. This book is selfless love. This book is EVERYTHING, and I NEED more of Eloise, Finn, and India, as I feel their story has only begun. Heart-pounding, butterfly-fluttering, soul-shattering, feels flowed through me fast and furiously as The Impossible Vastness of Us touched me every part of me. Like a gaping wound, this story cut me open as it bled angst, exposing every emotion. All of the words made me FEEL ALL OF THE THINGS!!! The Impossible Vastness of Us is an emotional explosion that BLEW ME AWAY from beginning to end. I was OBSESSED with and OWNED by this romance. 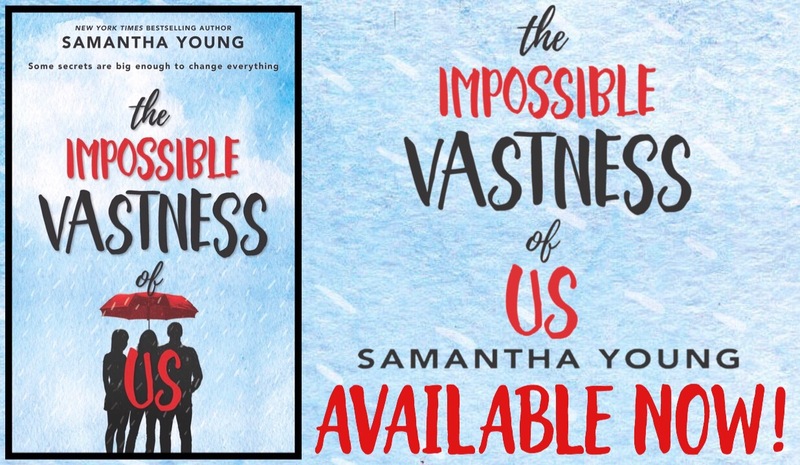 Samantha Young brilliantly brings characters to life that captivate through a journey of heartbreak and healing. You NEED to get touched by this UNIQUE and UNPUTDOWNABLE ROMANCE. HEARTBREAKINGLY BEAUTIFUL and UTTERLY BRILLIANT, The Impossible Vastness of Us is an unforgettable coming of age love story you’ll feel forever.